Registration is open from 8.15am – 10.00am but you must register at least 30 minutes before the start time of your event. 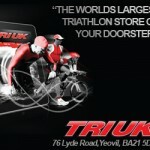 All prizes for the event have been sponsored by Triuk, Yeovil (www.triuk.com) and Ride Bike, Poole. We are delighted to say that event photography will be provided by www.actionpic.co.uk - photos will be available through their website following the event. Refreshments will be available near the transition/registration area. All proceeds from the refreshments will go to the Budmouth College ‘End to End Challenge’ charities. Bike pampering will be available at the Wurth stand – get your chain set running smooth!! Have I missed the entry deadline for this event? If I send the form tonight will it be ok, sorry I meant to do it a couple of weeks ago!! Hi Adam – no you haven’t missed it yet – look forward to receiving it.